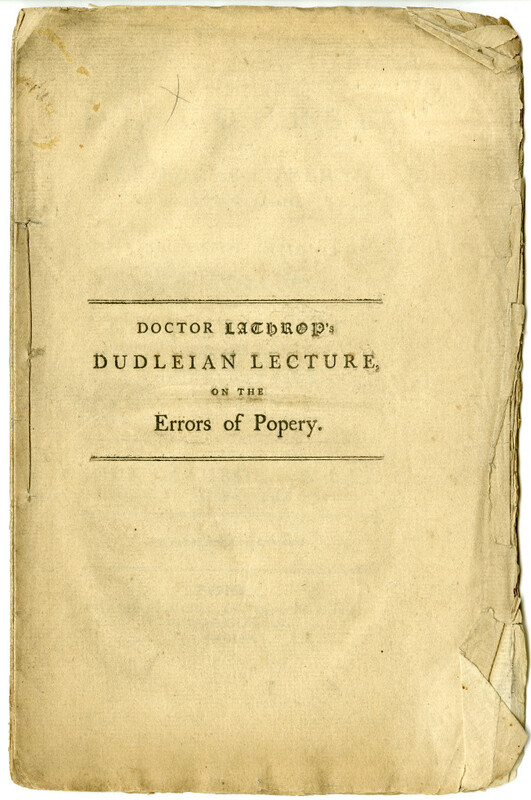 The papists bloody oath of secrecy, and letany of intercession for the carrying on of this present plot. Robert Bolron, London: Printed for R. Taylor, 1680. A new exhibit in the Msgr. William Noé Field Archives & Special Collections Center Reading Room highlights materials from our Anti-Catholic Ephemera collection. This small collection dates from 1765-1952. 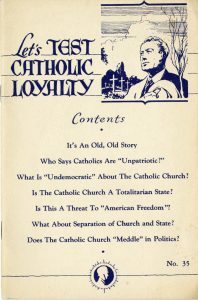 It contains several pamphlets expressing anti-Catholic sentiment and denouncing Catholicism. 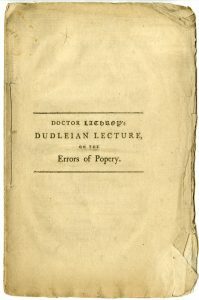 Although they are not displayed in this exhibit, the collection also includes some materials relating to the Philadelphia Nativist Riots, in which Protestant nativist groups lashed out against Irish Catholic immigrants and burned several Catholic churches. 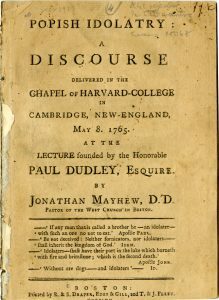 In addition to materials from the Anti-Catholic Ephemera collection, several of the items in the exhibit are from our Rare Books collection. 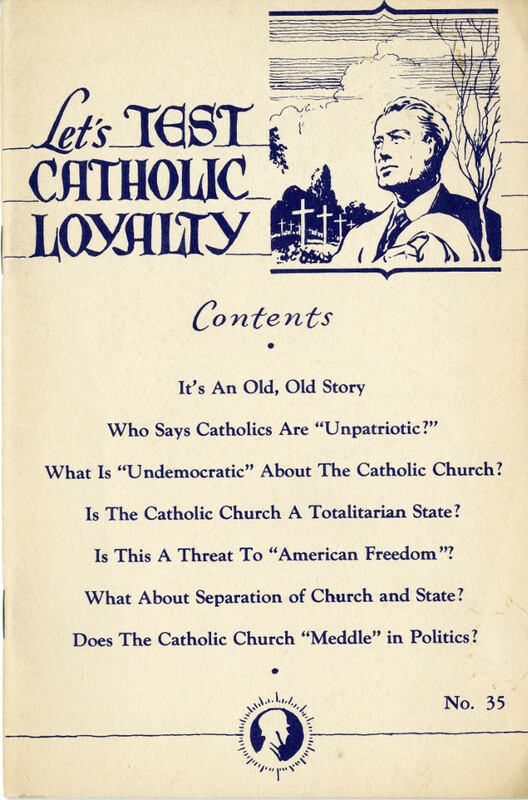 “Let’s Test Catholic Loyalty” – a pamphlet by the Knights of Columbus in response to Anti-Catholicism, 1952. Anti-Catholicism grew out of the Protestant Reformation in the 16th century, and continues in some forms today. It was most common in countries that were majority-Protestant, such as Great Britain and the United States, and sometimes led to discrimination and violence. 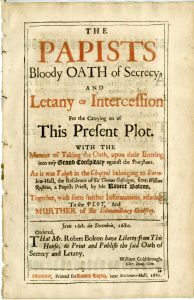 Catholics were often derogatorily referred to as “papists” or “Romanists,” and were suspected of remaining loyal to the Vatican rather than their countries. Anti-Catholic sentiment overlapped with movements such as nativism when majority-Protestant countries experienced an influx of Catholic immigrants. 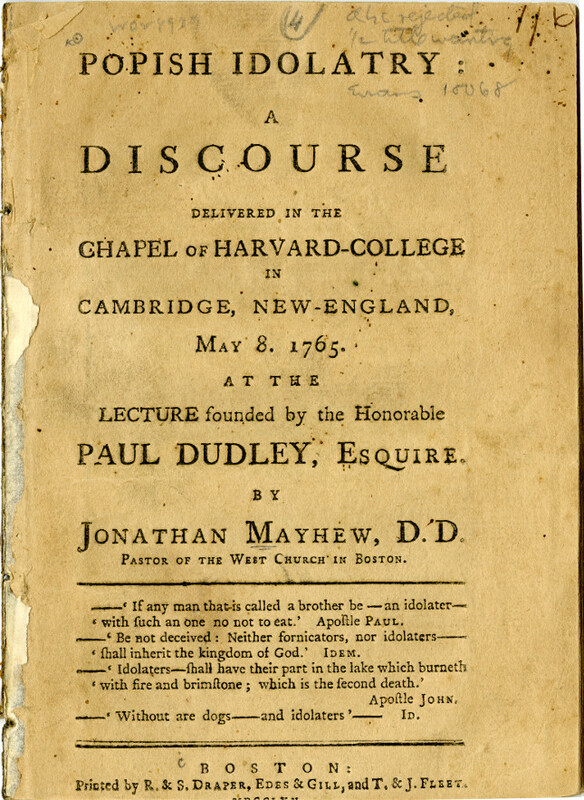 Some of the items featured in this exhibit include “Let’s Test Catholic Loyalty,” a 1952 pamphlet produced by the Knights of Columbus as a response to Anti-Catholicism; Popish idolatry; a discourse delivered in the Chapel of Harvard-College in Cambridge, New-England by Jonathan Mayhew, 1765; and The papists bloody oath of secrecy, and letany of intercession for the carrying on of this present plot by Robert Bolron, printed in London in 1680. 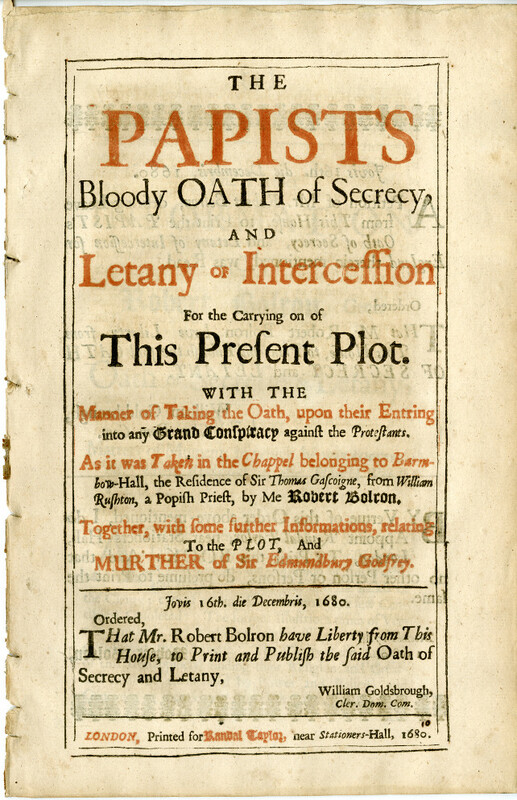 This document relates to the “Popish plot” and murder of Sir Edmund Berry Godfrey, an English magistrate whose mysterious death stirred up Anti-Catholic turmoil in England. For more information about the exhibit or the Anti-Catholic Ephemera collection, stop by the Archives or contact us at archives@shu.edu or (973)761-9476. 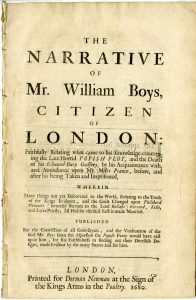 The narrative of Mr. William Boys, citizen of London. 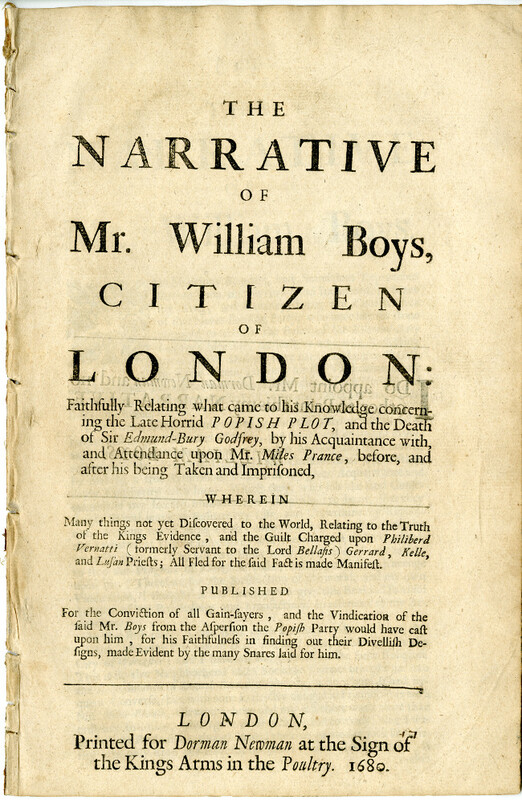 William Boys, London: Printed for Dorman Newman …, 1680. 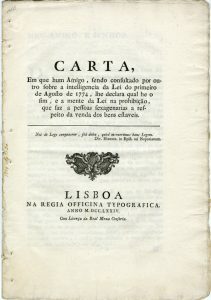 “Carta em que um amigo sendo consultado por outro sobre a inteligencia da lei do primeiro de Agosto de 1774”, Anti-Church Law Explained. 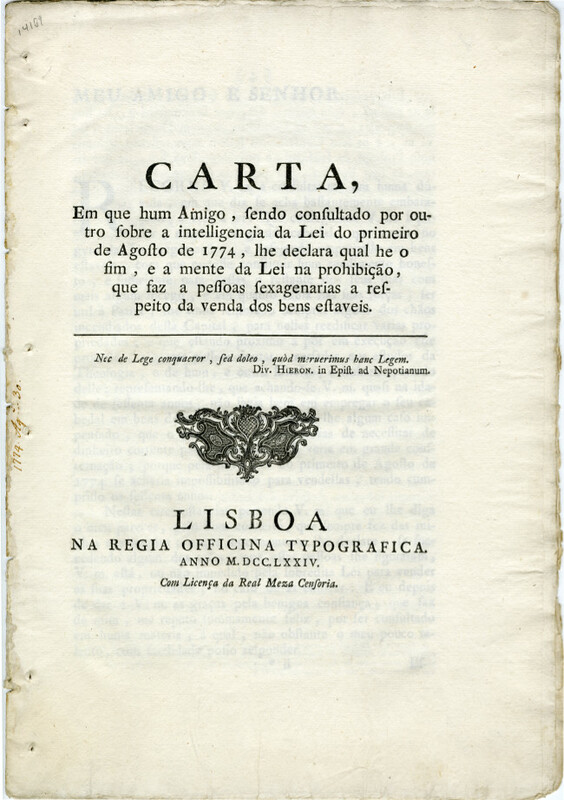 Lisboa: Na Regia Officina Typografica, 1774.